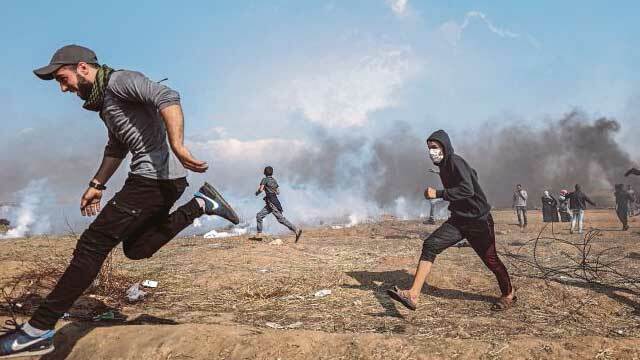 Gaza, Apr 28 (Just News): Three Palestinians were shot dead Friday as thousands demonstrated along the border between Gaza and Israel for a fifth consecutive week of rallies dubbed the Great March of Return. More than 300 other people were hospitalised for gunshot wounds and tear gas inhalation, Gaza's health ministry said. Forty-four Palestinians have now been killed by Israeli fire since major protests began on March 30, with over 1,500 more wounded. No Israelis have been hurt. Marchers are demanding the right to return to their homes seized by Israel in 1948. Israel says that allowing the refugees in would mean the end of the Jewish state, and accuses Gaza's Islamist rulers Hamas of using the protests as a pretext for violence. It said that at one point the protesters attempted a mass breach of the border fence intending to break into the Jewish state. "At the peak of today's events, active members of the Hamas terror organisation led hundreds of rioters on a violent mass infiltration attempt towards Israeli territory," an English-language military statement said. It added that during the attempt "they hurled explosive devices, hand grenades and firebombs at troops." In what the army said was a direct response, Israeli warplanes late Friday attacked "six military targets belonging to the Hamas terror organisation's naval force in the Gaza Strip." It did not give the location of the targets but the Hamas interior ministry in Gaza said aircraft -- originally reported as drones -- hit Gaza's main port, damaging two boats but causing no injuries. Eyewitnesses at the port said the two boats were badly damaged, but Hamas security forces prevented journalists from reaching the scene. It is believed to have been the first time Israeli aircraft had targeted boats in Gaza since the 2014 war there between Israel and Hamas. The protest movement is officially independent but has the backing of Hamas, which has fought three wars with Israel since 2008. On Friday protesters again gathered at five sites near the border fence, though numbers were down on previous weeks. Dozens of young men burned tyres and threw stones a few hundred metres from the border, with Israeli soldiers occasionally firing tear gas and live ammunition. Two men, who were not identified by the Palestinian health ministry, were shot dead east of Gaza City, while a third, 29-year-old Abdul Salam al-Bakr, was killed along the border in southern Gaza. Three journalists were among those injured, the Gaza Centre for Media Freedom said. The Israeli army said in a statement around 10,000 Palestinians had taken part in "riots". "Attempts have been made to harm security infrastructure, roll burning tires, hurl rocks and fly kites with flaming objects attached to them." "Troops have used riot dispersal means and have fired in accordance with the rules of engagement," it added. Demonstrations are expected to spike again in the lead up to May 14, when the United States will move its embassy from Tel Aviv to Jerusalem. The decision has infuriated Palestinians, who see the annexed eastern half of the holy city as the capital of their future state. US President Donald Trump, who tore up decades of policy by recognising Jerusalem as Israel's capital, said Friday he "may go" to the city for the embassy opening. The mooted trip came as Amnesty International called for an arms embargo of Israel over the use of live fire. "For four weeks the world has watched in horror as Israeli snipers and other soldiers, in full protective gear and behind the fence, have attacked Palestinian protesters with live ammunition and tear gas," the human rights organisation said in a statement.